Multiple myeloma is a type of blood cancer. It starts in your bone marrow, the spongy tissue inside bones. This is where your body makes blood cells, including a certain type called plasma cells. These cells can grow out of control and crowd out the normal, healthy ones in your bone marrow. When they build up, they form a tumor. The name “multiple myeloma” means there is more than one tumor. Age: Most people with multiple myeloma are 45 or older. More than half are 65 or older. Race: The disease is nearly twice as common in African-Americans. Being male: It’s slightly more common in men. Heredity: Other people in your family have had multiple myeloma. You’ve had another plasma cell disease. Multiple myeloma can affect your body in different ways. Bones: The disease can make your bones weak and easy to break. Blood: Because your bone marrow makes blood, multiple myeloma can affect how many healthy blood cells you have. Too few red blood cells (called anemia) can make you feel weak, short of breath, or dizzy. Too few white blood cells (called leukopenia) can make it easy to get infections like pneumonia. It can take longer to recover from them, too. Having too few platelets (called thrombocytopenia) makes it harder for wounds to heal. Even minor cuts can bleed too much. To diagnose multiple myeloma, your doctor will do a combination of tests. When your doctor diagnoses multiple myeloma, she’ll try to give you an idea of how much the cancer has grown or spread in your body. This is called the stage of your disease. Doctors can tell what stage the multiple myeloma is in by looking at X-rays of your bones and testing your blood, pee, and bone marrow. 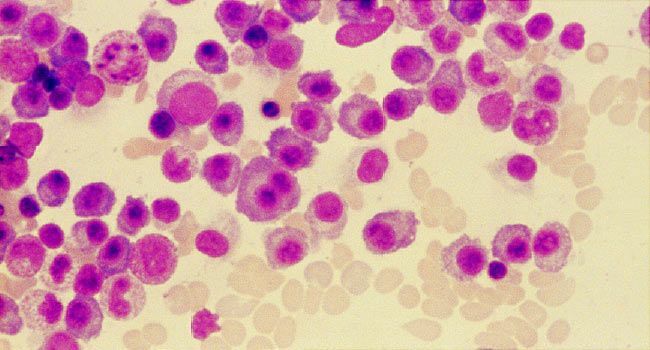 Smoldering myeloma: This is very early in the disease, when there are no symptoms or problems. The blood and kidneys are normal, and there is no bone damage. People who have smoldering myeloma often do not need treatment right away. Stage I: There aren’t that many myeloma cells in the body. Doctors can’t see any bone damage on X-rays, or the cancer has damaged only one area of bone. The amount of calcium in the blood is normal. Other blood tests may be only slightly off-balance. Stage II: This is the middle ground between stage I and stage III. There are more myeloma cells in the body than in stage I. Stage III: There are many myeloma cells, and the cancer has destroyed three or more areas of bone. Blood calcium is high, and other blood tests are abnormal. Immunomodulatory drugs: These drugs are the workhorses of multiple myeloma treatment. They work on your immune system. Some turn on certain immune cells, and others stop the signals that tell cancer cells to grow so they kill myeloma cells. Proteasome inhibitors: Proteasomes are protein complexes that help cells -- including cancer cells -- get rid of old proteins so they can be replaced by newer versions. Proteasome inhibitors prevent cancer cells from doing this. As old proteins pile up, the cancer cells die. Steroids: These drugs are used at all stages of the disease. High doses can kill multiple myeloma cells. They’re also used to ease symptoms like pain and pressure by stopping white blood cells from racing to affected areas. And they can help with side effects of chemotherapy, like nausea and vomiting. HDAC inhibitors: These drugs stop multiple myeloma cells from making too much of the histone deacetylase (HDAC) protein, which helps malignant cells quickly grow and divide. Antibodies: These immunotherapy drugs help your immune system fight cancer. They bring antibodies into your body to target specific proteins on multiple myeloma cells. Chemotherapy: These drugs treat cancer by killing cells that are in the process of dividing. They also kill healthy cells around them, which causes unpleasant side effects. Allogeneic stem cell transplant, which uses cells from a donor. The latter is less common because of the risk of rejection. You usually get the transplant along with chemotherapy. Radiation: This treatment uses high-energy particles, or rays, to damage cancer cells and prevent them from growing. You get it from a machine that sends high-energy rays into your body. Adjunctive care: These treatments help manage the side effects of medications and complications of multiple myeloma. Supportive care: These treatments can make life with multiple myeloma easier. They include physical therapy, nutritional counseling, massage, exercise, and more. Hospice care: When your condition no longer responds to medication, this option will provide pain and symptom management to keep you as comfortable as possible.